The common hairstreak (Strymon melinux) is also known as the gray hairstreak. There are over 70 different species of hairstreak butterflies. The name hairstreak is derived from the thin (hairlike) extensions located on their hindwings. They belong to the family Lycaenidae. They are small butterflies and are commonly seen as their name suggests. Despite their small size they are very pretty butterflies. 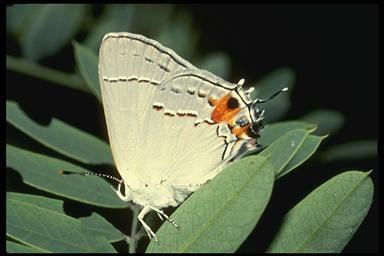 Common hairstreaks are found throughout North America. The common hairstreak caterpillar is green and is considered somewhat of a pest because it feeds on farmers' crops. Some crops the common hairstreak caterpillar feeds on are strawberries, corn, cotton, hops, and bean seedpods. The caterpillars also feed on oak leaves. Once the caterpillar is fully developed it forms a brownish-black chrysalis. The common hairstreak remains in the pupal stage during the winter and emerges as an adult butterfly in the spring. Copyright © 2008-2018 ButterfliesSite.com. All rights reserved. Images from the Corel Corporation - and may not be copied.